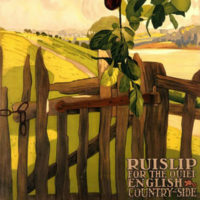 Ruislip has a long history, with records from the time of Edward the Confessor showing it was owned by the Saxon Wlward Wit, a thane of the king. The medieval parish of Ruislip covered modern Ruislip, Northwood, Eastcote, Ruislip Manor and South Ruislip. Wit lost much of his land during the Norman conquest, and in 1086 the Domesday Book records that it belonged to Arnulf de Hesdin. Before he went to fight in the Holy Land in 1087, Arnulf gave Ruislip to the Benedictine Bec Abbey (in France). He died in the Holy Land and a commemorative mass is held every June at the Sacred Heart Church. During the 13th century the parish church, dedicated to St Martin of Tours, was built, along with the Manor Farm complex. The Great Barn was used to hold the tithes paid to the Abbey by its tenant farmers. The woods were harvested for timber which was used in the construction of parts of the Tower of London in 1339, Windsor Castle in 1344 and the old Palace of Westminster in 1346. The Dissolution of the Monastries by Henry VIII led to the ownership of Ruislip passing to King’s College, Cambridge. They remained the main landowner in the area until the 1930’s when they sold the remainder of their holdings to Ruislip-Northwood Urban District Council and gave the Manor Farm Complex and King’s College Playing Fields to the people of Ruislip. Ruislip Village Postcard – looking towards Sharps Lane from the mini-roundabout. That’s Prezzo on the right. 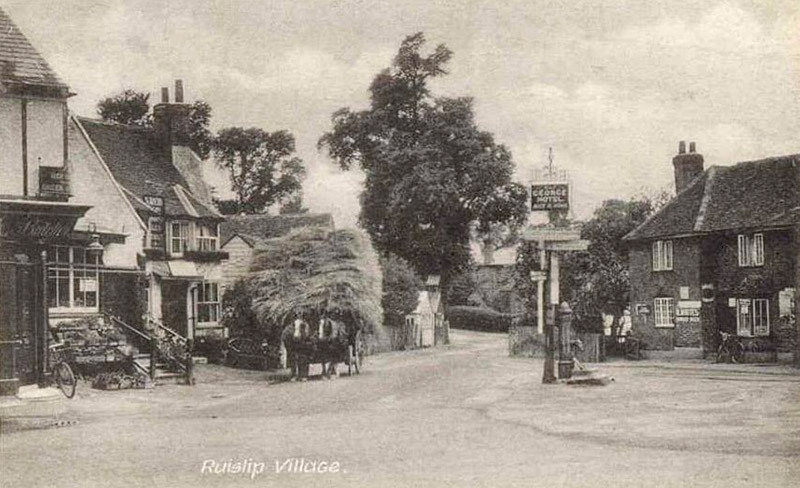 Ruislip remained a small village in rural Middlesex until the coming of the railway, in this case the Metropolitan Railway, now part of London Underground. Large new housing estates were built, and the shopping streets of Ruislip’s High Street and Ruislip Manor’s Victoria Road, giving us the modern town we have today.